Yesterday on QUILTscial we experimented using Eleganza thread for Sashiko embroidery. I really enjoyed doing the Sashiko embroidery and can’t wait to do more. 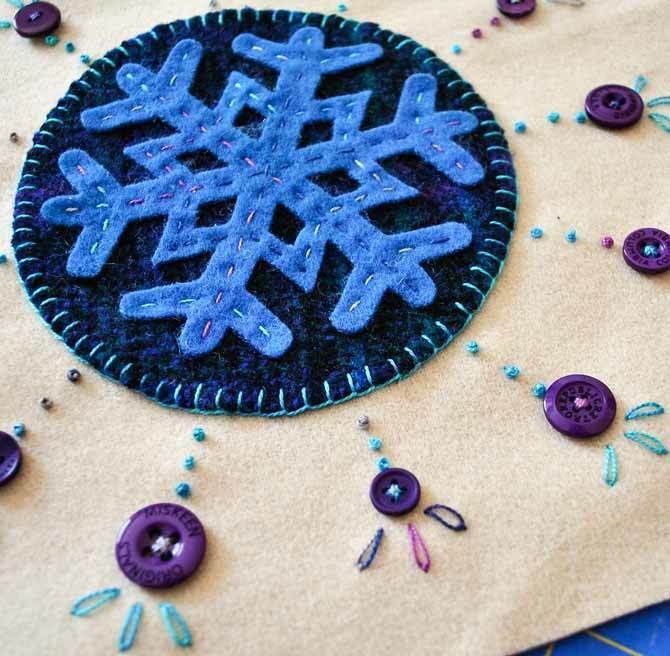 Let’s look at using WonderFil’s Eleganza thread for wool applique, one of my favorite things. I absolutely LOVE doing wool applique. I’ve designed and made many, many projects with wool many of which I have published as patterns or have been featured in magazines. I dyed my own wool and I made wool kits and items to sell in my Etsy shop. The only problem with wool is that it can be expensive to buy, so one of my favorite things to do is to applique wool onto cotton backgrounds as this makes the wool project a bit more economical. Usually I do my wool applique with hand dyed embroidery floss, but I have used WonderFil threads before and found them to be just lovely for wool applique and embroidery. 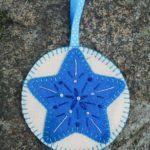 Check out these wool applique ornaments that I made using Razzle and Dazzle threads from WonderFil. Some of the Eleganza threads that WonderFil sent me were in cool colors that reminded me of winter. The teals, purple, blue and gray made me think of snowflakes, so I dug through my wools and found some pieces that I thought would work well with the threads. 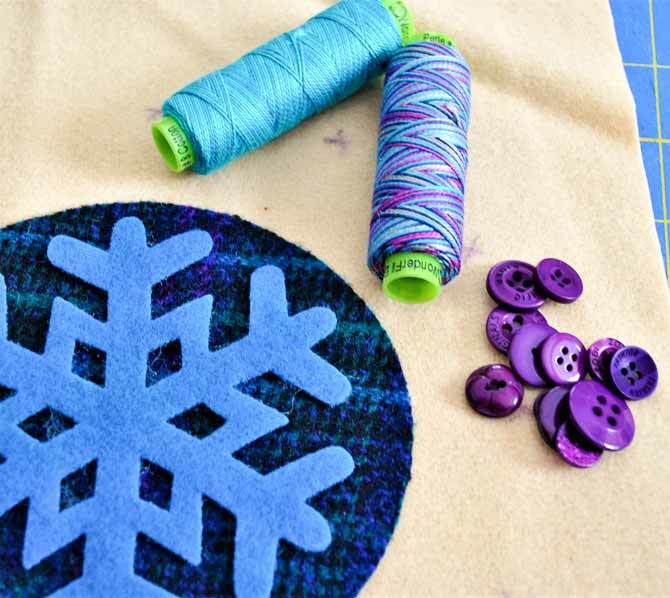 I used my Accuquilt Studio cutter to cut a snowflake shape out of teal and a large circle out of a blue/purple plaid. I cut a rectangle of cream colored wool that was 10″ x 20″ and then folded it in half to make a 10″ square. I used 505 Spray to stick my shapes to this wool square. I use this spray all the time when I’m doing wool applique as it holds the shapes in place very well and doesn’t gum up your needle as you sew. For more information about using 505 Spray check out my Blog post where I make felted wool table runners. I have a large button collection, so I found 12 purple buttons ranging in size from ½” to 1″ and arranged them in a circle around the applique shapes. I then used my marker to mark an “x” where each of the buttons was placed so that I could remember where to sew them when all of my stitching was done. Using an erasable marker, mark an x for each button placement. I picked two of the Sue Spargo Eleganza threads to use for my project. The colors in these threads are just beautiful!! 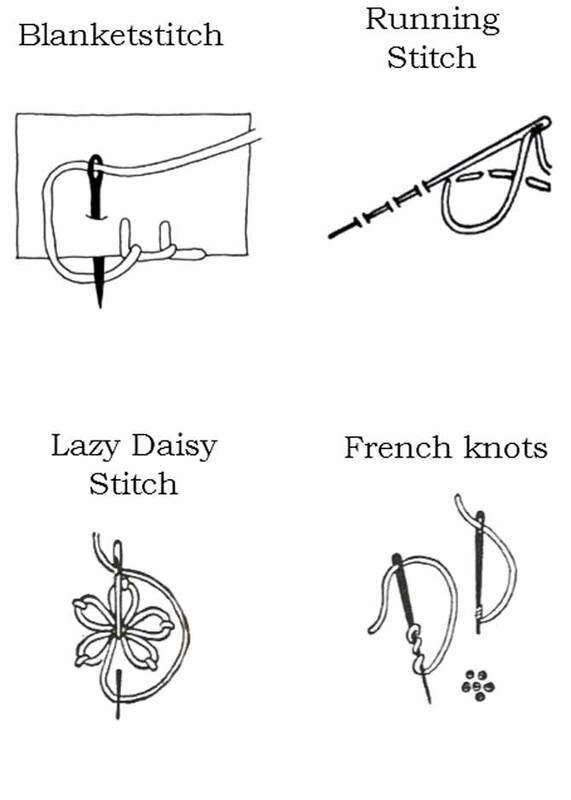 I got to stitching by first securing my snowflake with a running stitch down the middle of all of the parts. Next I used a blanket stitch to secure the circle to the wool background. I sewed all of the buttons to the background using the marks that I had made as a placement guide. Next came my embellishments using french knots in between each button and the circle and some lazy daisy stitches on the opposite side of each button. Now that the wool applique and embroidery is finished, this piece and the Sashiko sample are ready to sew into snap bags. Join me tomorrow as I show a fun technique involving lengths of metal tape measure to make a bag that snaps closed. 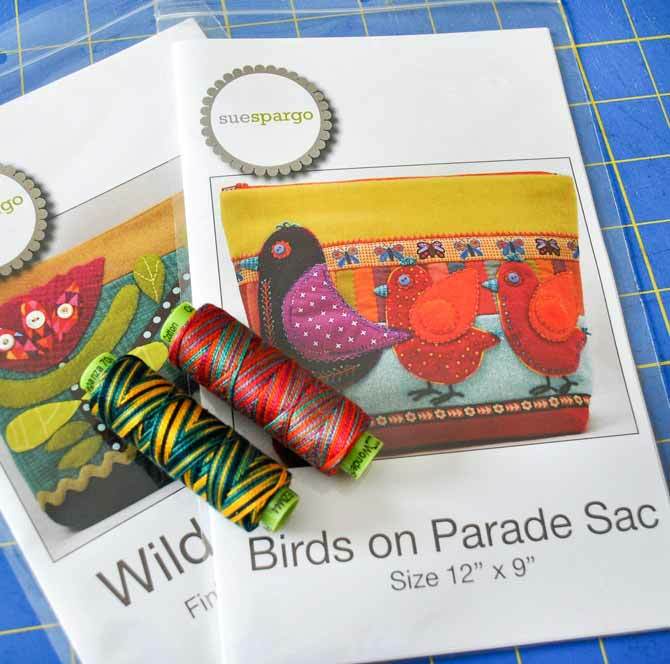 For now though, I’ve really enjoyed using WonderFil’s Eleganza thread for wool applique and I can’t wait to stitch up a couple of the Sue Spargo patterns that I purchased at quilt market – the other Eleganza threads look like they’ll be perfect for them! Tks for the info on this thread. You’re welcome – glad you found it informative!